And Armedia was the right choice for the job. Armedia, LLC, is a Veteran Owned Small Business, founded in 2002 on the fundamental premise that organizations were facing challenges in managing structured and unstructured data. As an experienced vendor with more than 15 years of experience in the ECM world, Armedia has supported Federal Government and Commercial organizations with their ECM needs with products such as EMC Documentum, IBM FileNet, Alfresco, Microsoft SharePoint, Drupal, Captiva, Kofax, and Ephesoft. Armedia has successfully performed migrations for the Federal Bureau of Investigation, the US Office of Personnel Management, Consumer Financial Protection Bureau and Delta Air Lines. 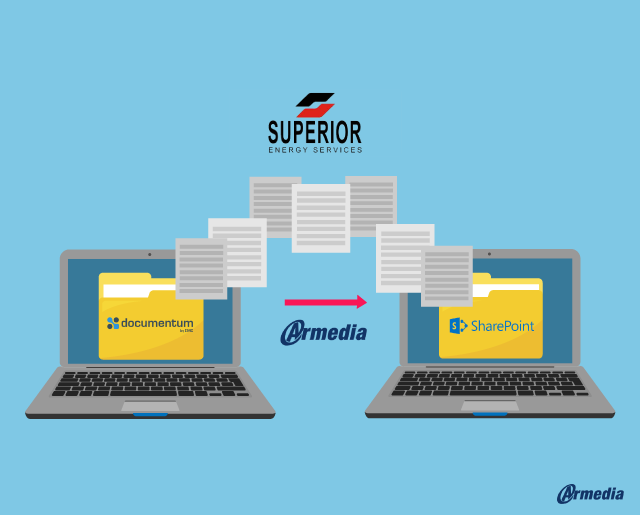 And how did Armedia help Superior Energy with their migration from Documentum to SharePoint? Extraction of Documentum information from the cabinet and folder structure, to system properties, document types, and respective custom properties, usernames, groups, and access rights. Using DRX (Documentum Repository xPlorer), an innovation created by Armedia employees, we will provide a detailed report of the repository. Document output from the stakeholder sessions. Based on the Data Assessment Document, Armedia mapped the new folder structure, document types, and document properties how it would look in SharePoint 2013. This mapping exercise identified custom properties needed in SharePoint 2013. Map the user groups and access rights. This final step included utilization of the Armedia Caliente Migration Suite to perform migration from Documentum 6.5 to SharePoint 2013. If data manipulation is required during the migration, processes are implemented to perform the required transformation or manipulation on the data and integrated into the migration process. Armedia recommends, at a minimum, 2 SharePoint 2013 environments: Development/Test and Production. Executed the migration in the Development/Test environment. Tested the integrity of the migrated data. Items to validate are object counts by document type, object content size, specific metadata migration, folder mapping, object owner mappings, user and group mappings, and permission set mappings. Repeated steps 2-4 until test results were satisfactory. Executed the migration in the Production environment. If you have a SharePoint Migration project and would like to find out more details, please contact Armedia. We will make sure to create your path of migration as painless as possible.